I'm not sure what the hell I did, but every song I have on my SD card show the exact same album cover in my media player. I have went into my SD card and deleted my songs and put them back, still the same. There is likely a thumbnail folder that you can delete to reset things. I would try going into: "Settings > Applications > Manage applications" then go over to the "All" tab and find the HTC music app (there may be a stock Android one, but I'm rooted and don't see it) and clear the data and cache. That should force it to refresh the album covers. Thanks for the advice. However, I've looked for a folder and there wasn't one. I even went ahead and deleted all folders I didn't know what they were. I also cleared the date for the music app (am using the default internal app) and still face the same issue. Have you tried the last ditch method of rebooting the device? The only other thought I have is that the album image often get added to the ID3 tag of the mp3. Have you verified that the mp3s don't have the same image in their ID3 tag? Yes. I have performed a hard reset several times. It happened when I added some Weezer songs. I'm thinking that might have something to do with it. However, I do not have those songs on my PC anymore, so If I delete them they are gone for good. So are the problematic songs still on the EVO? If you were to copy the songs off the EVO on to a PC and then delete them. Add a different song, what does the album artwork look like? I did as you said. Deleted all Weezer from my SD card (backed up on PC). And still all album covers show as Weezer. Man, you're doing a good job of stumping me today. There are some album art apps in the market that you could try. I'm out of suggestions for the time being. I'll post up if I think of anything. Thanks. I will give those a try. Thanks for your help. This is probably not the ideal solution, but you can install and use it to download album art for each album. Most of the downloaded album should carry over to the stock music player, if you decide to continue using that. I have a problem similar. On mine it shows the same Eazy-E on almost everything. Just started doing it a few weeks back, kinda annoying but im just glad my music is fine. How did you get the music on the phone? Originally I used the HTC sync software on only my mp3 had album art, my wma files did not. To get the covers to show up, I deleted all the songs off the phone and then transfered them using the drop and drag method and all the covers showed up. I may have a solution... Make sure you have artist and album information when you import your songs. If you have one track that has 'unknown album', once you load artwork on that track, it will show up on *all* tracks that have 'unknown album' .Even if you delete the track and reimport it, it will still have the same artwork that has originally been attached to the 'unknown album' You may have to delete those tracks and reimport them with the the artist and album information. This way the phone will properly sort them out and attach the proper artwork that goes with each album. Hope this helps!! I'm using Gtunes for my music... Everytime I upload a new song I use an app called Album Art Grabber to fetch the cover art. Works great because it gives you two different search engines to find the art. It's always found the cover art, even obscure music is recognized. coachpelkey and C3Pdr0id like this. Mines Does This Also ! 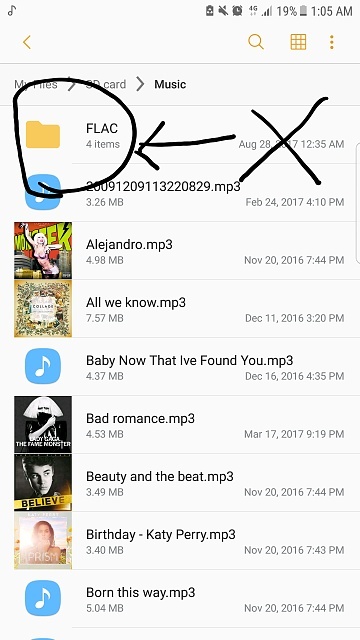 What I Do Is download the cover art downloader and remove the cover art from the song that it was downloaded with and it goes away . If You Delete The Song It Will Stay There . Why hasn't anyone added an app where you can fully deleted embedded art work? I want fx manager or another manager to be able to do this task without the need to link to a computer. Luckily poweramp app you can override it's album art by searching correct one but I don't think it's not something you can save for when you buy new phone or take out memory card. OKAY I FIGURED IT OUT!!!!! This has been bugging me for years but i figured it out today. If you are in fact experiencing the same issue as me which i think you and most android users are i have sorted out how Android looks at album art in general. Okay, so per file you have the Artist, Title, and Album ID3 Tags. Normally, in windows, if there is album art embedded in the file (this is called the file cover) its smart enough to display it, THIS IS NOT THE CASE WITH ANDROID. Android will ALWAYS pull the album art from whatever the folder.jpg (traditional way album art is handed out) is inside that folder the MP3 is in (if there is no folder.jpg it will use a random album art from any song in the folder). Now the CORE OF THE ISSUE is that if you look at your MP3's ID3 tags, you NEED something set for the album field ( i set this to the same as the title, or the artists). If you don't it will insert the Folders name and inherit the Album art for the folder, which will be nothing, or a random art for whatever song it chose at random. EDIT: I use Tag&Rename to quickly edit all my album tags it literally takes one second, theres an option under tools that copies one field to another for every individual song in one shot - i copy the title field to the album for anything that dosn't already have a album title set. EDIT EDIT: Also if you want something to populate for whatever dosn't have album art, just put a picture of your choosing in that folder and name it "folder.jpg"
« So sick of this scrolling issue when going through older text messages.